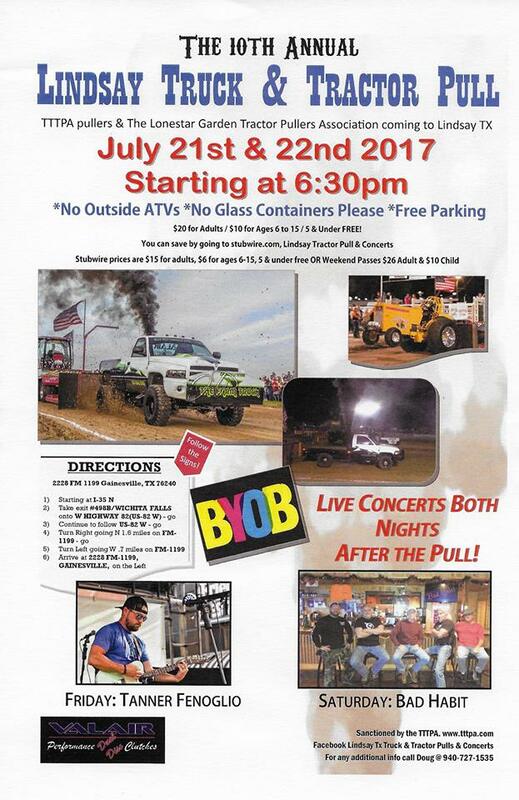 The LSGTPA tractor pulling teams will be preparing for the Lindsay Truck & Tractor Pull, scheduled for July 21st and 22nd. 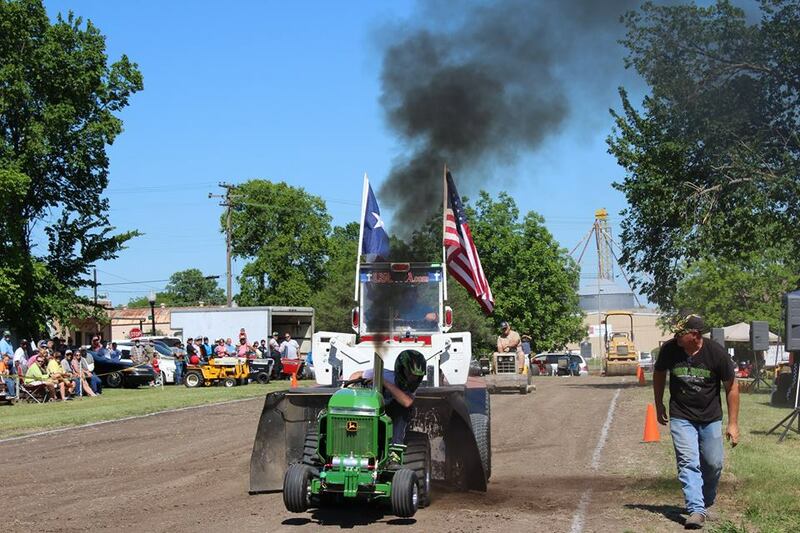 The double header event will feature pulling teams competing in two rounds of LSGTPA tractor pulling action, on both Friday and Saturday nights. The event will feature dual pulling tracks, for non-stop pulling action ! The smoke rolling is scheduled to commence at 6:30 pm. Bailey Inglish constructed Fort Inglish in 1837, to serve early settlers near the fork of Powder Creek and Bois d'Arc Creek, in present day Fannin County. As the community grew, the town was known as Bois d' Arc. By 1844, the towns name was changed to Bonham, in honor of James Butler Bonham. 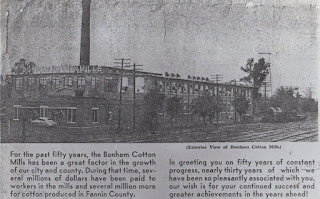 As the 1880's rolled around, so did the Texas Pacific Railroad and the Bonham Cotton Mill industry. By the early 1900's, the Powder Creek Park area was a booming industrial complex. 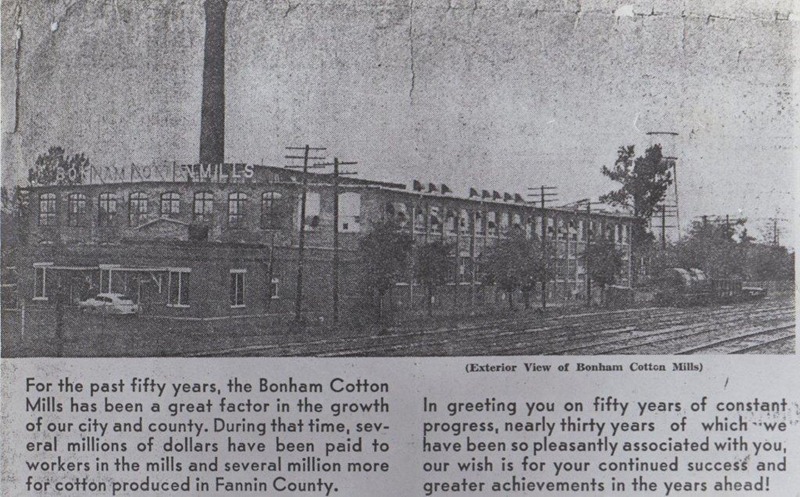 Texas & Pacific Railroad operated a machine shop and round house facility alongside the Powder Creek, and the Bonham Cotton Mill complex operated twenty-four hours a day. Steam engine power shook the ground next to the Bonham Depot for more than 50 years. Most days, the Powder Creek Park is now a peaceful place. 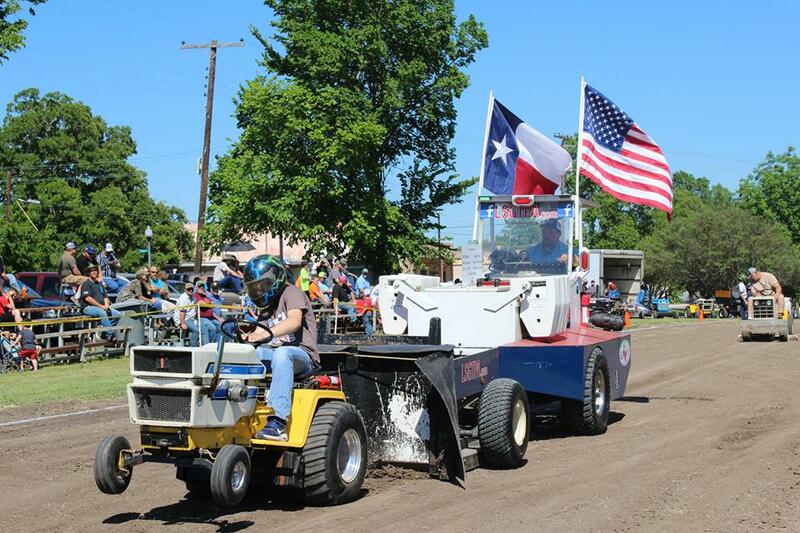 But, on Saturday during the Bonham Heritage Day Festival, the ground would shake again as the Lone Star Garden Tractor Pullers Association teams would roll into Powder Creek Park, for the 'Battle At Bonham'. 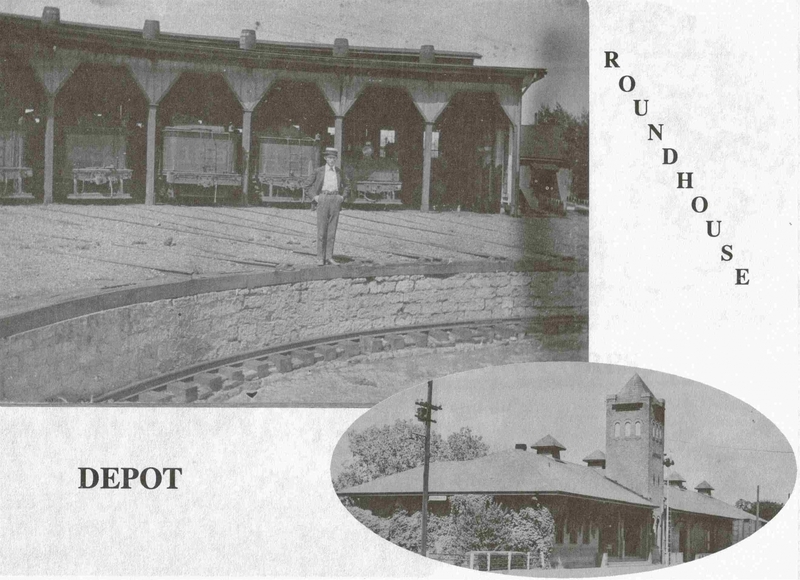 A two hundred foot track alongside the historic Texas & Pacific Railroad bed, just a stones throw from the old roundhouse and across from the Fannin County Museum, would be prepared for the pulling teams from across the state. 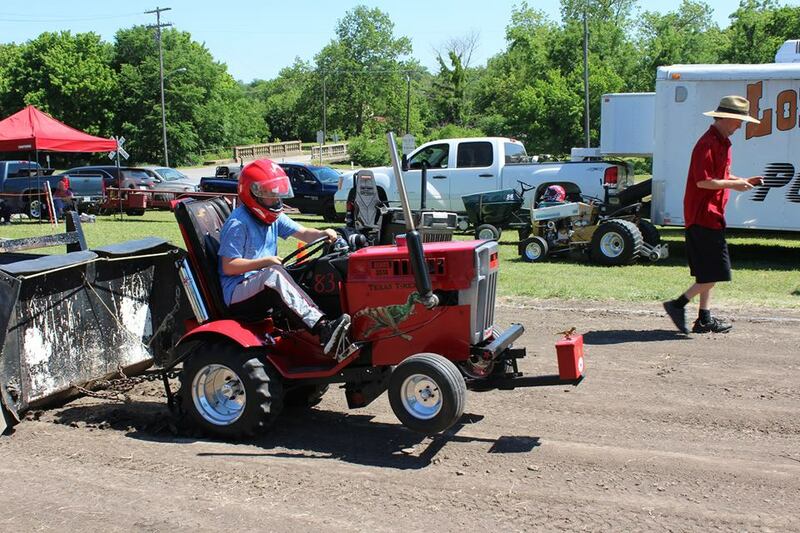 Drivers and machines would battle for class titles, in two rounds of LSGTPA tractor pulling action. Award winning McKinney High School choir member Bailey Melvin, would deliver an outstanding National Anthem performance to start the show. 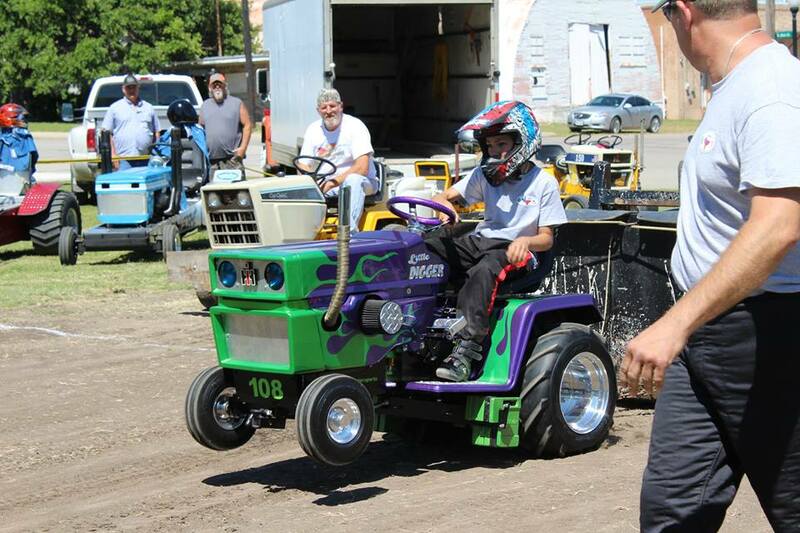 The LSGTPA Youth Class competitors would take to the track first, with Tatom Robinson wheeling his 'Little Digger' tractor to his first event win. Cody Doyle would pilot 'Old Yeller' into the runnerup spot. Lane Duncan would power his 'Texas T-Rex' into the third place podium position, and would wheel his 'Twisted Kitty' tractor to a fourth place finish for the Duncan Motorsports team. Jared Stephan would steer his 'Iron Head' tractor to a top five finish for the Moody Pulling Team, and would serve as a hired gun aboard the 'Yes Deere' tractor, to score a sixth place finish for the Mean Green Pulling Team entry. Stock Class would be paced by Claude Lewis, aboard his 'Old Yeller' machine. Wade Robinson would score a second place finish in the class, with James Helfferich placing third on the podium. In Hot Stock Class competition, home town favorite Kody Langham would take the victory, aboard the Longhorn Express Pulling Team entry. John Aufdenkamp would pilot his 'Rusteze' entry to a runnerup finish, with Aidan Hovind wheeling his 'Yes Deere' machine to a third place finish. 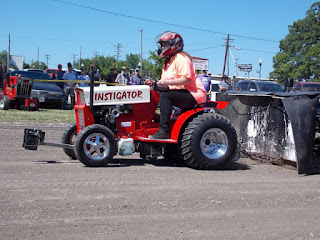 Madison Pellerin would drive her awesome looking 'Instigator' machine, to a fourth place scoring. In Stock Diesel, Aidan Hovind would wheel his 'Buckshot' entry into the top spot, with Ken Langham Jr. taking the runnerup position. Gary Bramlett would pilot the 'Warthog' tractor onto the podium in third place. Big Stock Class would see John Aufdenkamp taking the victory for the Outlaw Pulling Team. 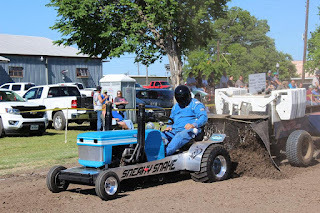 Jerry Toland would steer his 'Triple Deuce' entry into the runnerup spot, with Gary Bramlett running his 'A Muck' tractor into the third place slot. Jeff Robinson would ride the 'Texas Thunder' tractor to a fourth place finish on a couple of wild rides, and James Helfferich would work his way to a top five finish on the day. In Outlaw Class competition, Paul Smith would take the class title aboard his high winding 'Texan' tractor. 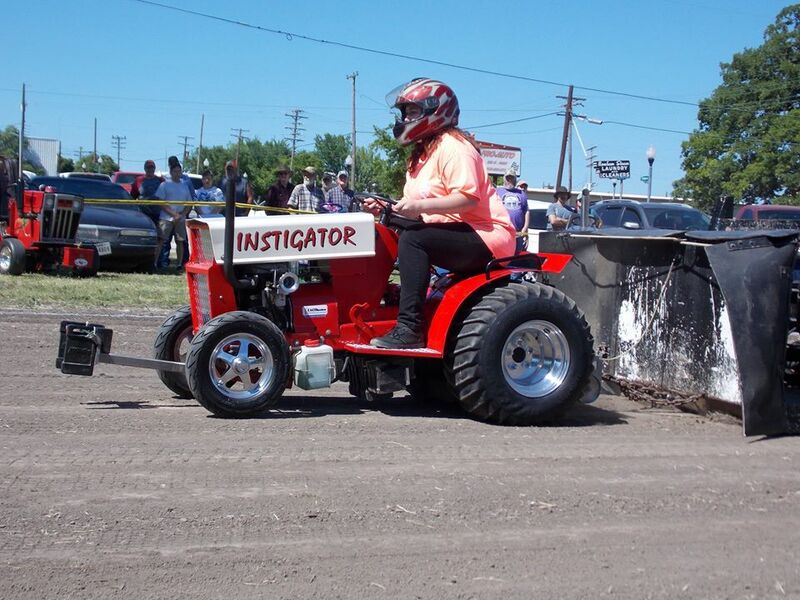 In Mini Rod Class action, Jerry Toland would wheel his alcohol injected, 'Shinin Time' tractor, into the top spot. Colby Crowe would work his 'Weekend Warrior' tractor to a runnerup finish. 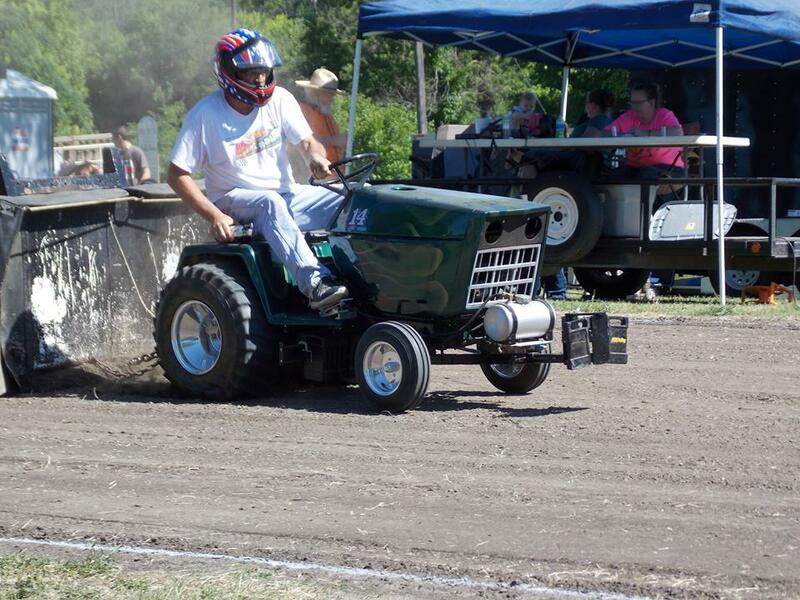 David Houchen would manage a podium finish aboard his 'Back In The Day' tractor, scoring the third place position. Steve Hovind would roll coal aboard the turbocharged diesel, '99% Moody' machine, to score a fourth place finish. Paul Smith would return with his 'Texan' tractor, to score a top five finish in the class. Super Rod Class tractors would close the show, with Ken Langham using a final round Full Pull aboard his Ford powered 'Sneaky Snake', to secure the class title and the first win aboard the new tractor. The driving tandem of Ken Langham, Sr. and Kolby Langham would pilot the 'Psycho' tractor to an opening round Full Pull, to secure the top two positions in the class for the Longhorn Express Pulling Team. John Kiemele would wheel his 'Dodge This' machine into the third place position, after a wild ride in the first round resulted in an out of bounds disqualification. Randell Moody would wheel his 'Ridge Runner' machine into the fourth place position, for the Moody Pulling Team. 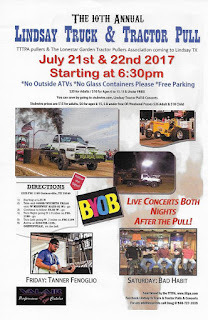 The LSGTPA teams will prepare for a double header event in Lindsay, Texas on July 21st and 22nd. Event details and pulling information can be found at www.lsgtpa.com.